This review has been a long time coming and I’m very happy to bring you the first of many Micro Land reviews! Thank you for your patience and I hope you enjoy my review of this really fun product. 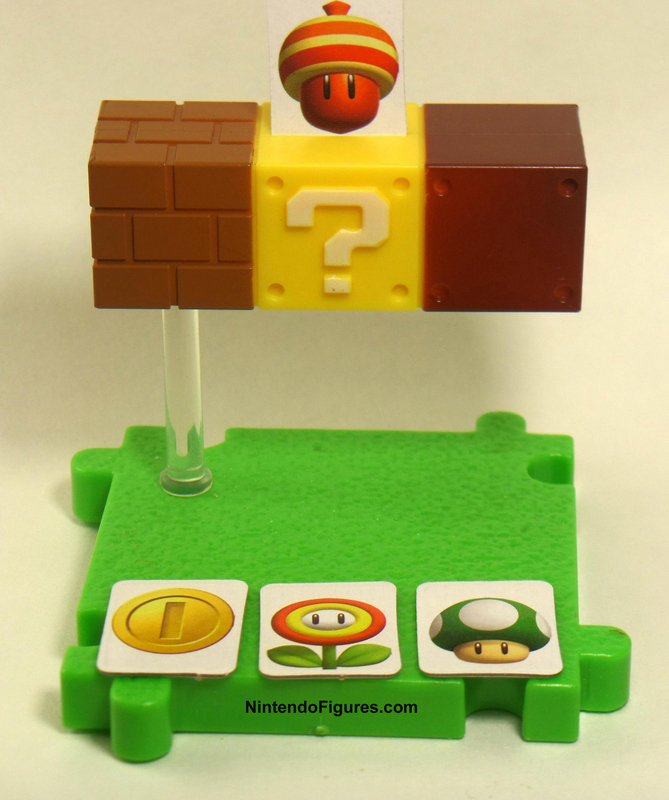 Contents – Five Tiles, one Fire Mario figure, and Four Power-Up pieces. 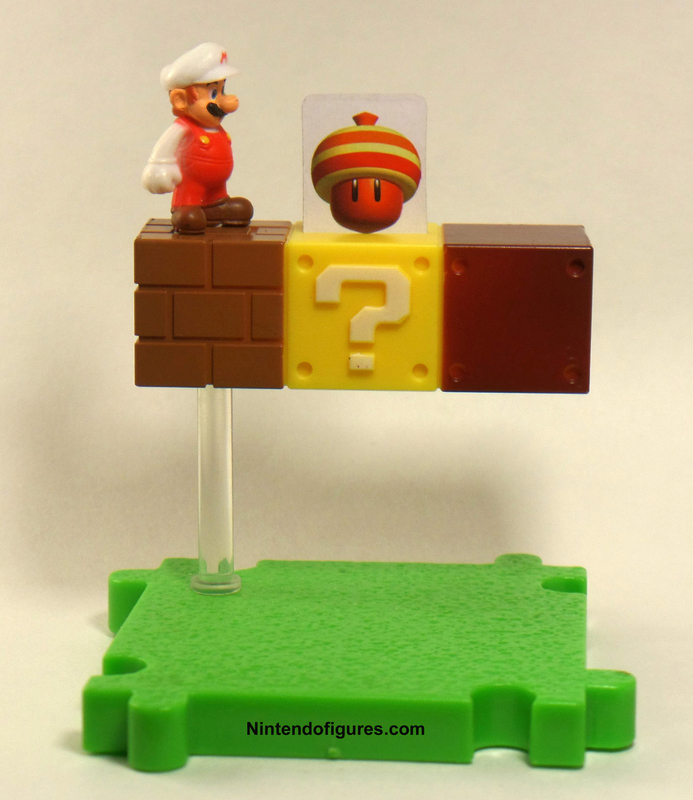 Introduction – The Deluxe Playsets for New Super Mario Bros. U come with a few features that make them an ideal purchase for anyone wanting to start building their own Mario levels. For one, it gives the most tiles for its price ($18 versus $22 for two smaller playsets). The Deluxe Playsets also come with a flag tile for the end of the level and the Power-Up pieces which are nice to have with the block tiles and currently only available in the Wave 1 sets. With that said, let’s look at the actual components. Block Tile – The most common tile across all of the playsets thus far is one with three blocks. Not only does this tile look nice, but it lets you use the Power-Up pieces. What I like most about this tile is the open space beneath the question blocks. If you’re making a 3D level, this gives you some space to put figures which the other tiles lack. Mushroom Tile – The mushroom tile is simple, but effective. 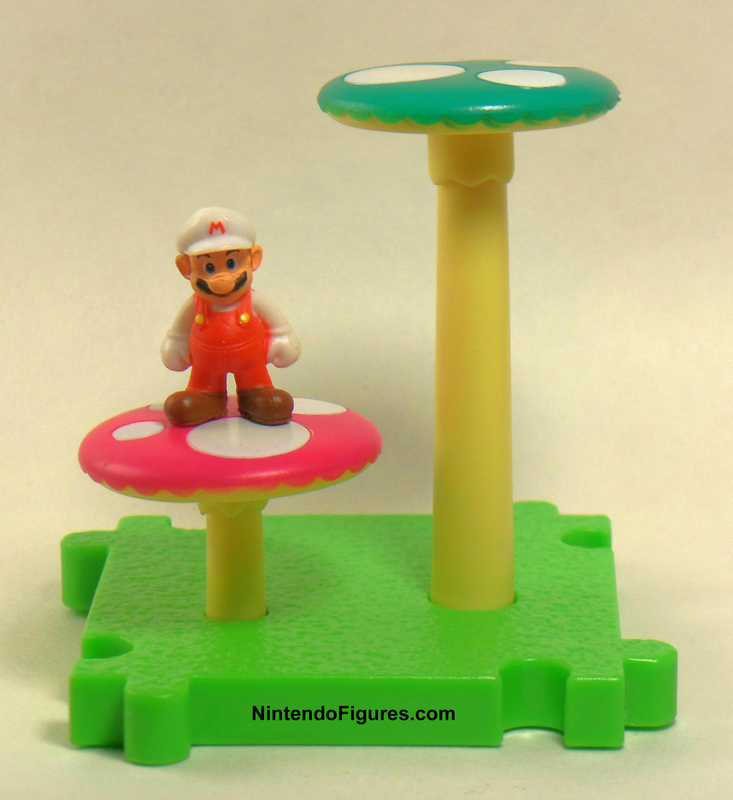 The mushrooms are easy to link with lower or higher tiles and figures sit on them well. If you’re building a 2D level, the mushrooms can make a great “background” piece which hides behind another tile. 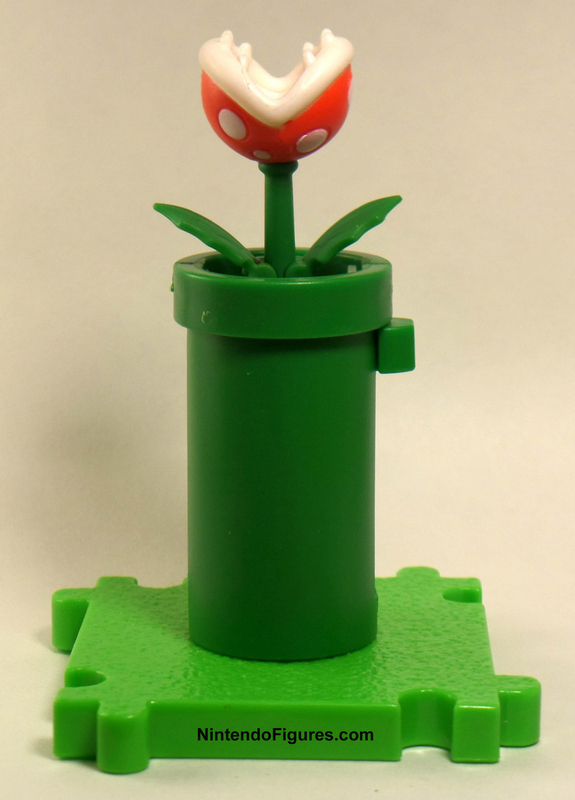 Pile Tile – What would a Mario level be without a pipe or a nasty Piranha Plant? This tile not only looks good, but allows you to display or hide the Piranha Plant however you want. The pipe is quite tall and could also be used as a background piece. Red Shell Tile – This tile has a play mechanism that simulates Mario jumping on a Koopa Troopa. 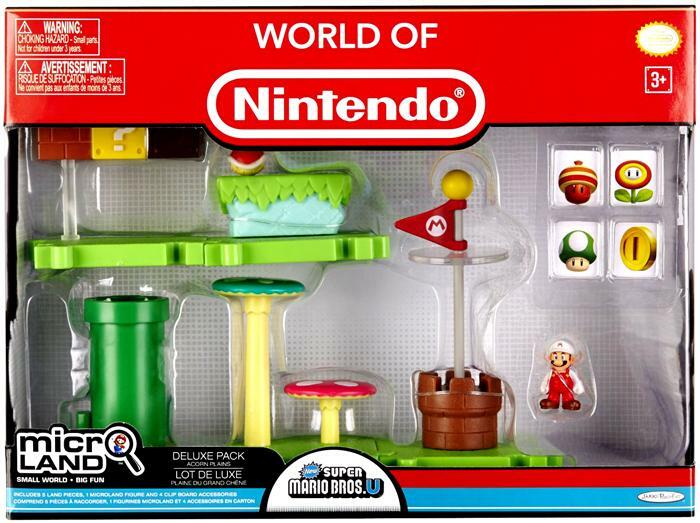 This would be fun for anyone looking to play with Micro Land but as a collector building a display, it is less than ideal. The red button sticks out and looks untrue to the video games. The turtle shell is always empty/has the Koopa Troopa hiding which looks odd in a display too. While this tile works well as a playset, it probably won’t appeal to collectors quite as much. 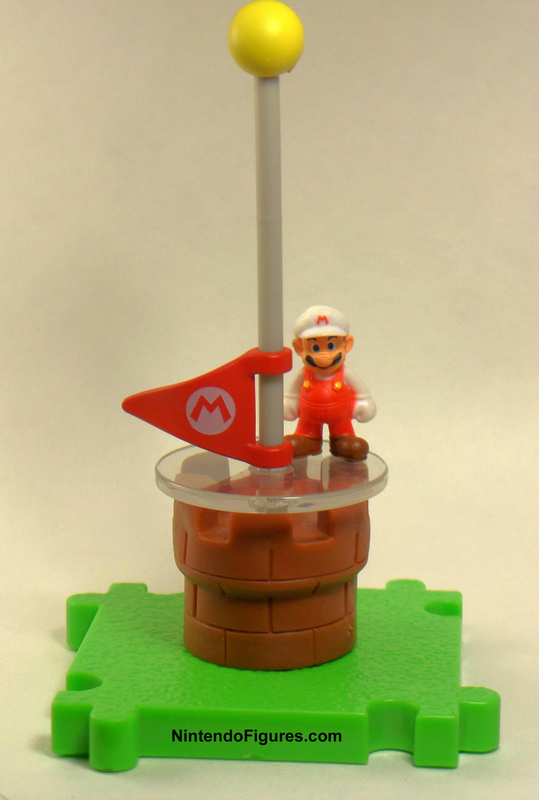 Flag Tile – Having a flag at the end of your level not only looks great, but you can adjust the flag from the top to the bottom and put a character on top of the clear plastic so it looks like Mario is sliding down with the flag just like in the video games. On the reverse side, there is a Bowser logo too so you can show that Mario still hasn’t beat this particular level yet. It is hard not appreciate the attention to detail and flexibility the flag tile has and anyone building a level will want to have it. Fire Mario and Power-ups – The Fire Mario in my set looks fantastic and has only the smallest of paint imperfections. I may have just been lucky, but he really shows off how great the figures in Micro Land can be. The Power-Ups are small white pieces of cardboard with different Power-Ups depicted. These fit into the Question Mark box and can stick out to look like the game. The white backgrounds do not look great as a display and the cardboard can be hard to pull out once it is all the way in the block. The idea behind the Power-Ups is good, but the execution is a disappointment to both collectors and could be quickly damaged by kids. Jakks Pacific will hopefully come up with better ideas for this in the future. Why This Set is Great For Collectors – Even with the five tiles, it already feels like you’ve got a great start to a level, especially with the flag pole. It is nice that each tile is unique and it represents the style of Acorn Plains well. While the scale is not accurate, the size of the Deluxe Playset is great because it doesn’t take up a lot of room and offers the flexibility of 2D and 3D displays. 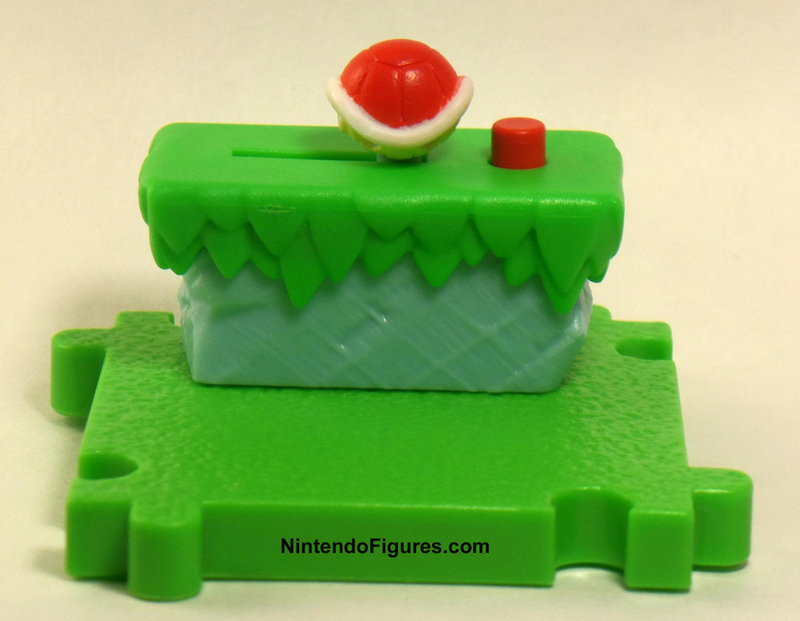 How This Set Could Have Been Better For Collectors – In addition to the previously mentioned issues with power-ups and the Red Shell Tile, the set feels a little bare with just one figure. A single enemy would make you feel like you have a real level where with just Mario it feels a little empty. 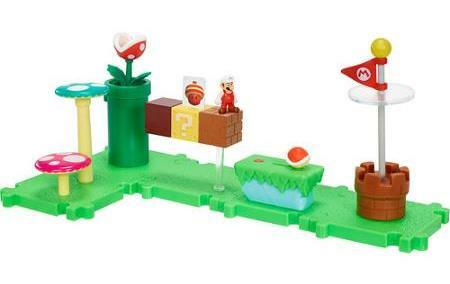 This playset features a lot of tiles which are vertical and Mario levels tend to have a lot of flat spaces too. As crazy as it might sound, a few tiles that are flat would actually make this look even more like a Mario level. This is a problem that is true of all of the Micro Land tiles released so far, but it it is definitely noticeable with these five tiles. Many of the tiles have flash where the machine that made the piece didn’t cleanly cut the plastic. This can be removed with a hobby knife, but that is also one way Jakks Pacific can improve the quality of the Micro Land product. Closing Thoughts – While there are a few downsides, overall, this set is a fantastic place to start your Micro Land collection. The tiles capture the feel of Acorn Plains well and will make you want to get more tiles to flesh out your level. Acorn Plains pairs well with the water tiles in Wave 2 (or 1-2 as Jakks Pacific calls it) and so this is a pretty versatile set. At the Toys R Us I have visited, Acorn Plains is much rarer than Layer Cake Desert so you may want to pick up this set sooner than later. If you buy a Deluxe Playset, I highly recommend picking up at least one figure pack to go along with it so you have a lot of display options and will enjoy messing around with the design of your level. I feel like I got my money’s worth with this set and am looking forward to expanding my level in the near future.